Three men water newly planted trees on March 18 in al-Qosh, an ancient Christian village in northern Iraq. The village emptied out last August as Islamic State fighters approached. But the extremists never entered al-Qosh and the village and residents have returned. The men are watering outside a monastery that dates to the 7th century. The ancient Rabban Hermizd Monestary, on a hill overlooking the northern village of al-Qosh, is a testament to the long history of Christians in Iraq. 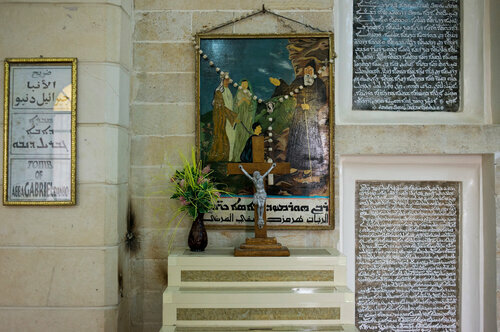 Stone walls leading up the hill are decorated with iconography, and the 7th-century monastery is covered with the ancient Syriac language, still spoken today by the people of al-Qosh. "Christians have been here in the Ninevah plains for thousands of years. It would be a tragedy if we just disappeared," said Athra Kado, a local Syriac language teacher. But on Aug. 6 of last year, the people of al-Qosh did disappear, in a manner of speaking. The self-declared Islamic State, or ISIS, was within about six miles and had been advancing rapidly in northern Iraq, overrunning Mosul, Iraq's second largest city, as well as other towns and villages in the area. Kurdish forces that opposed ISIS, known as the Peshmerga, came to al-Qosh on the night of Aug. 6 to warn the residents they were in imminent danger. The Peshmerga "threw a barricade across the road just outside al-Qosh, but we knew that wouldn't stop" ISIS, said Kado. Ancient Assyrian, a language dating to biblical times, decorates the Rabban Hermzid Monastery that was built in the 7th century. The residents fled, leaving al-Qosh a ghost town. But something curious happened. For reasons unknown, ISIS stopped stopped short of al-Qosh and never tried to enter the village. After a while, the residents felt secure enough to return and it has been buzzing with activity this spring. The markets are open, the schools are running, and families are picnicking on the hills overlooking al-Qosh. While all appears well for the moment, the future of Christians in Iraq and elsewhere in the Middle East is not particularly bright. Christians in Iraq numbered about 1.5 million, or about 8 percent of the population, before the U.S. invasion that ousted dictator Saddam Hussein in 2003. More than a decade of war and upheaval has prompted many Christians to leave. Today the Christian population in Iraq is estimated to have dropped below 400,000. The Christian exodus from Iraq is one part of a larger trend that has been playing out for decades throughout the wider Middle East. In the mid-20th century, Christians were estimated to be about 20 percent of the Middle East's population. Today, it's 5 percent at most. In 2008 and 2010, al-Qosh became a safe haven for civilians fleeing turbulence in the Mosul area, about 30 miles to the south. The same thing happened again before and after the ISIS threat last August. Elderly women from the countryside have stayed in an empty local school. The women said they were comfortable and well provided for, though they hoped to return to their homes. The residents of al-Qosh have now set up their own militia in hopes of protecting the village should it again be threatened. Kado and a number of his friends serve rotating days on militia duty, patrolling the town and the surrounding area. As they climbed the flower-covered hill behind the monastery to water newly planted trees, they reflected on the situation. 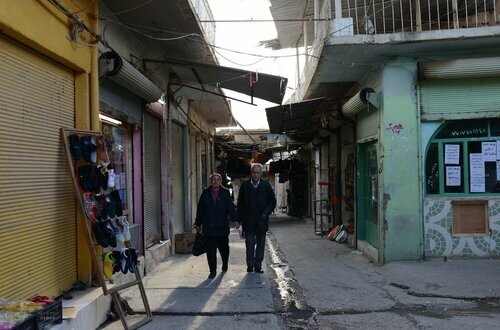 An Assyrian Christian couple walks through the market area of al-Qosh, where most residents have returned after fleeing last August in the face of an advance of the Islamic State. The ancient village is about 30 miles north of Mosul, Iraq's second biggest city, which is still held by the Islamic State. "We come up here to picnic, to be with our friends. This is our town, we don't want to give it up," said Riven Nafe, an engineer. A priest in a local church, Gabriel Gorgis, said it is the world's duty to help protect dwindling Christian communities in place like al-Qosh. "Look around at our history," said Gorgis. "We have been here for thousands of years. Wouldn't it be a shame to the world and future generations to lose us?"